In the past 2 weeks, several experiences have converged around one larger idea that I have become pretty excited about - connecting an online game or virtual world to the museum experience through mobile based characters. 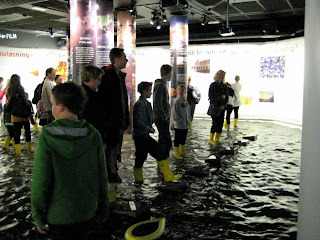 So to begin, after visiting the Teknisk Museum (see here, and here, with possibly more to come), I was really thinking about those remote controlled boats in the flooded climate exhibit. The staff person expressed that they were often not used as fully as intended. Children were supposed to use the boats to "travel around the world" viewing the impact of climate change at different parts of the exhibit. He felt that kids were often preoccupied with just driving the boats, and weren't grasping the larger experience. Whether or not this exhibit was succeeding is debatable, but what really intrigued me was this idea of children guiding something around a museum space. It also reminded me of some previous work - namely, the notion of Teachable Agents. So my thinking was, removing children from the role of learner and placing them in the role of guide or teacher may be more fun and engaging, as well as enhance learning in the museum. Then my mind jumped back to my Fulbright project. Mobile Phones! What about a teachable agent on a mobile phone? A more engaging, learning centered tamogotchi. Or, to put it another way, a more interactive remote controlled boat. So in my mind was a mobile phone based character that children take around with them in a museum - teaching (and learning) as they experience exhibits, but also providing a narrative for a museum experience (who is this character?) But what if this mobile teachable agent, this character, exists outside of the museum? This is where my thinking was, when the next day, I stumbled onto a blog from another museum and technology designer - Nina Simon - and read an article called "What Cross-Platorm Gaming is Doing for Books... and Can Do for Museums" about a book series that overlaps with a video game. This is exactly what I had been thinking about! An online game, that extends in to the museum. Great! But, as if this wasn't enough encouragement, the following day, I happened to find out about a lecture that all of my fellow researchers were attending at the university. The talk was by professor Jay Lemke, from the University of Michigan, and he spoke about something called Transmedia Literacy. Now my understanding of this idea is that we now are exposed to, and participate in, cultural artifacts that span across different forms of media. Lemke's example was Harry Potter - our understanding of Harry Potter is shaped by books, movies, video games, fan fiction, etc - and each of these media contribute to our understanding of who Harry Potter is. Our literacy refers to the ways in which we are able to observe, participate with, and contribute to these media. Lemke ended his talk by asking how education can better engage with these transmedia experiences. SO, this talk immediately brought me back to phones and museums. I'm imagining a child at home, playing in an online virtual world. Through this character, they're able to interact with other children also playing the game. The child can also take the character with them (through their mobile phone) to the museum. At the museum, the character becomes a teachable agent. The child guides the character around (just as in the game) and teaches them from the various exhibits. As the character (and the child) gain knowledge and interact with exhibits, new skills and abilities become available in the virtual world. 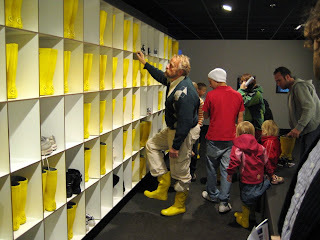 In this way, the learning experience exists outside the museum, and becomes more engaging and fun. **(Two years ago I investigated the motivating factors behind a particular sports video game. In this college football video game, the player must control all of the aspects of their character's life - playing in the football games, practicing, going to classes, passing tests to remain eligible for the games, etc). The thing that convinced me that teachable agents may be so engaging was that a friend of mine found himself "playing" this game by studying for his character's chemistry test, rather than studying for his own real life exams. 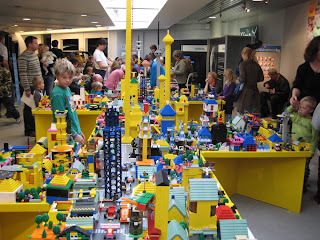 To continue my reflection on my recent trip to the Oslo Teknisk Museum (see Part 1) I'm going to describe a second temporary exhibit - the "Lego Festival." I've always been a big Lego fan - as a child, and more recently as a designer seeking simple prototyping tools. The exhibit was on the second floor of the museum, and there was a fairly long line at the bottom of the staircase of people waiting to be granted entry. We were able to slip past by promising to only observe and not "play." 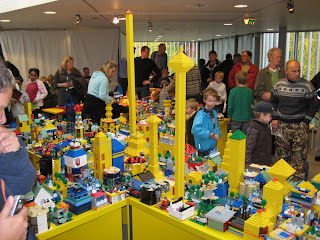 The space consisted of several large tables of lego structures organized as a colorful city model. The space was crowded as well, with many parents hovering along the outside as their children examined the the creations. Some parents seemed to be quite involved in the play as well - working over the shoulder of their child. The most interesting space of all was probably the "construction table." 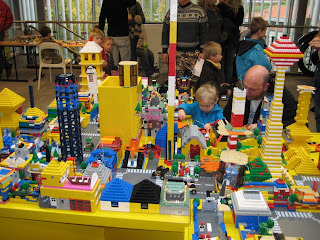 Apart from the rather formally organized existing structures, were a few tables with huge piles of Lego pieces laying in the center. This is where children were doing the actual building before their creations were moved to the cityscape. Technologically, this exhibit was pretty basic as lego has been around forever. BUT the social interactions happening in the space were just so much more developed than anything else in the rest of the museum. Children were collaborating, sharing pieces, discussing their creations. I got the sense that some of these interactions were occurring across family groups. Socially, this was great, but it also felt like a larger scaled version of an at home activity. This is perfectly fine, of course, but it did make the other, more elaborate and impressive exhibits seem solitary by comparison. 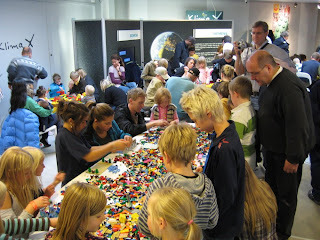 How can other exhibits and museum experiences create social learning environments like these Legos? My hope is that mobile technology may be one way to provide this extra social layer to the phenomena of existing exhibits. Maybe mobile phones can help create exhibits as social communities. How? I'm not certain yet, but if you have ideas, let me know. Yesterday, I visited the Norsk Teknisk Museum - a a science center not unlike like the Museum of Science and Industry in Tampa - with a combination of interactive science and technology exhibits, child-oriented exhibits, along with more historical exhibits on the history of industry in Norway. I'm going to break this visit up into 2 or more posts, as I took quite a few pictures, and would like to capture a few different directions of thoughts and observations. I actually made this trip to the museum with a few members of the master's class that I'm working with. It was nice to have people to interact and discuss our impressions with. I'll start with the exhibit that most impressed me. 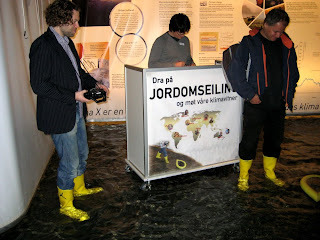 This was an exhibit called Klima X (about climate change around the world). It was very very cool. You round a corner and walk down a dark ramp, and the water level on the floor rises to just over ankle depth. You're now in the exhibit. 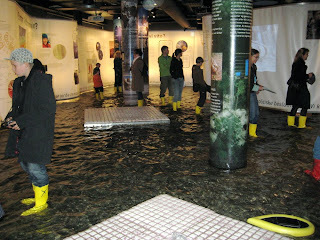 The entire exhibit is flooded, and there's a lot going on. Around the walls of the space are texts and projections revealing the impact of climate change around the world. There is a large chunk of ice melting on a platform. Rain occasionally falls over in one corner. Visitors are driving remote controlled boats around the exhibit as well. Below, you can see that "parking" a boat inside some of the columns gets video to play. There are interactive components in the space as well. Polling questions are projected onto a wall, and visitors vote by placing their right or left foot onto a pedestal (below). The results of that round of voting, along with the average results from the history of the exhibition are displayed as well. A greeter by the entryway hands out the boats and remote controls. These are two of my project partners. First of all, the boats were really popular. Several times I was amused to have a kid steer his boat into my legs, and I think this playfulness enhanced the atmosphere for the kids as well as the crash victims. Talking with the staff person we learned that 'many children don't get it' - that the boats occupy their attention at the expense of the larger themes of the exhibit. When I asked what they 'don't get,' I realized that perhaps I was missing something as well. Apparently the boats are supposed to let children "travel around the world" inside the space and see the implications of climate change in these different environments - a concept i really like. But why would this aspect of the exhibit be unsuccessful? (at least according to the staff person). Using technology elements to connect exhibits together is something I've explored before (see my master's thesis project), and I'll continue to think about this issue in the context of mobile phones. Also, in retrospect, other than the flooded floor along with the boats, the actual texts and rest of the space are maybe not particularly innovative. BUT, this was an incredibly exciting place to be in. It seems that this extra experience of sloshing through water, really transforms what is primarily a text and video experience into something exciting and even a little emotional. I didn't see any portion of the exhibit that visitors manipulate temperatures or water levels in order to observe changes. 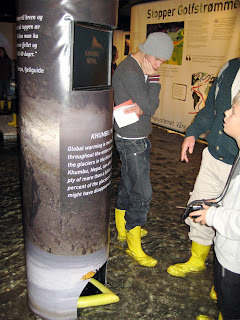 If I were designing the exhibit, I would include some simulation (whether physical or digital) to allow people to play with the system - to develop an understanding of the relationships between these environmental factors (Sim-ClimateChange ?). I also must add that the text was mostly in Norwegian with some shorter English explanations as well - so its quite possible that missed certain elements. This small potential missed opportunity in no way diminished the impact of the experience. This was a cool and inspiring exhibit! I'll post more reflections and pictures from the rest of the museum soon. I've seen many examples of the ways in which digital technologies make it very easy to study the social networks of organizations and institutions. Studying email messages lets businesses follow the paths that information takes through their organizations - to answer questions such as 'who interacts with who?' Social networking websites like Facebook let researchers study people's friendships and relationships with each other. Imagine we are able to give phones to everyone inside a museum. These phones would be both location aware (where in the museum is the user?) as well as proximity aware (who is the user next to?). With these phones, I'm really proposing a research methodology to examine the social network inside a museum. For this study, then, lets also imagine that we have a group of school children visiting the museum with specific small group tasks. We would use the information captured through the phones (described above) as well as visitor dialogue and action (possibly captured through the phones as well), to gain a detailed understanding of the social networks in the museum. 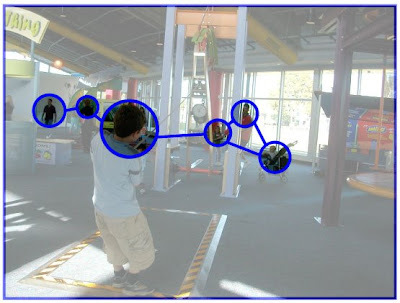 We would be able to learn: who is interacting with whom, the types of interactions as well as where in the museum these interactions are occurring.